The Grand Cerf team has unearthed the best gourmet addresses that Les Carroz has to offer. From the laid-back setting of a pub to a gourmet or stylish restaurant, there is something for every taste! Time for an aperitif? Come to Le Grizzly, a charming brasserie in the style of a typical English pub located at the heart of Les Carroz. With the added bonus of a cosy lounge area and a south-facing terrace! Check out: a wall of whiskies and a whole range of high-quality draft beers from all over the world! Once you have taken off your skis, how about a nice drink at the foot of the slops on the south-facing terrace of the Milk Hotel. At midday, you can enjoy an organic lunch based on original and generous bistro-style cuisine..
L’Igloo is an authentic Savoyard cabin located at an altitude of 1,598 m, at the arrival point of the Bergin (Morillon) chair lift. Open every day with continuous service, you can enjoy specialities from the Savoy region, daily suggestions and home-made desserts in the comfort of a flower-decked and sun-kissed terrace in the midst of the alpine pasture. Fondue, potato fritters, péla, etc. Cédric slow-cooks a range of traditional and top-notch specialities! Renowned gastronomic restaurant, Les Servages d’Armelle welcomes its guests to a very cosy space which affords a unique view of the mountains, whether you are seated inside, on the south-facing terrace or on the veranda which is a continuation of the terrace. The talented and passionate chef, Pascal Flécheau, expertly produces dishes of modern cuisine which are meticulous, generous, inventive and refined all at the same time. Special mention goes to the St Pierre fillets and grilled squid, not to mention…traditional fondue served with boletus mushrooms, an original variation that beautifully combines three jewels of Savoyard gastronomy: cheese, wine and mushrooms. The secret to the flavours of days gone by and authentic family cuisine is time! This dish, made with potatoes, lardons and onions and completely covered in reblochon cheese, is the star winter attraction par excellence. Where is it served in Les Carroz? Authentic tartiflette is served at Alpage de l’Airon, a 15-minute walk from the Airon bend or from the top of the cable car. # Tartiflette has not been around that long. See Wikipedia for more information! This entry was posted in Advice, La Clusaz on 2018/04/05 by Gareth Jefferies. Does my catered chalet have to be in the ski resort? I’ve just answered a question from one of our clients about the location for a catered ski chalet. I thought I would expand on it here. Qu. Rates aside is there any demand for the quieter out-of-town chalet or do 90% of holiday makers want the bright-lights? The closer to town the better for your own logistics and also to improve your retention rate. You can always attract the first time customers with good marketing and price but long term a small business has to have a good repeat business rate. Though there is a section of the market that will stick with amazing service and an out-of town location but overall you’ll make life hard for yourselves. Qu. We always do self-catered these days as we like mooching around town and looking in the shops. But things may be different in a catered chalet. Families may want the quieter place and never go out? There are many different kinds of people so we don’ t have to appeal to everyone but what is the accepted logic of chalet business please ? This is a funny one but although there are many types of skier you’ll find you will attract a certain sort. The customers will react to where and how you advertise and they will tend to conform to the image you project, as an example if your advertising says “family friendly” and has lots of pictures of kids, you’ll attract the families and not too many single travellers! On the question “will they go out”, given the opportunity a family will. There are always things to do and see in a ski village and most families don’t survive well cooped up. Though saying that if they have no choice and they are prepared with games and DVD’s a spacious chalet is fine too. Qu. Morzine or Chatel? We have only experienced the Morzine side so are interested in Les Gets/Morzine/St Jean D’aulps. Are we missing a trick? Is there good business opps in Chatel or Abondance? Much quieter though and quite far away in the car I think? As ski destinations go, Morzine, Les Gets and Chatel are on a par, Morzine and Les Gets have become more well known over the last 10 years, I don’t really know why, the upshot is that it is easier to sell a holiday but that there is now more competition! You can run a catered chalet business in the likes of Abondance and St Jean d’Aulps but I think you’ll find it harder in the long term. Watching the businesses in these places (and I live in St Jean d’Aulps) the majority (not all) tend to gravitate to the bright lights eventually (or give up). It may be that they started in the satellite towns, built up some expertise/clientèle and contacts and that gave them the leg up into the well known areas and that’s fine. Knowing this though, I would be tempted to start in the main town and if I can’t buy, rent. Some background. Morzine, Les Gets and Chatel are in the Portes du Soleil. I’ll list the main towns (more correctly Ski Stations or Ski Resorts) in bold and then the outlying villages. Morzine, followed in order of popularity with ski holiday operators > > Cote d’Arboz/Essert Romand, St Jean d’Aulps and then Le Biot. Les Gets probably has the same satellite towns as Morzine. Then of course there is the Grand Massif. Samoens is a popular town and has satellite towns of Morillon and then Verchaix. Les Carroz has Arâches La Frasse. Over in the Mont Blanc region we have Chamonix, it’s “villages” have grown up somewhat so Les Houches and Argentière are both in bold, Vallorcine is still an outlying village and Servoz even more so. Don’t forget St Gervais and Les Contamines and Megève (it’s unlikely you’ll be starting a business there!) which has outlying villages of Combloux and Cordon. In the Aravis there is the Grand-Bornand which has Entremont and Le Petit-Bornand and La Clusaz has St Jean de Sixt, Thones and Manigod. We have chalets for sale in all the above resorts. Many of them would be suitable as properties to be run as a chalet business. As an example here is Chalet Ancolie, situated in La Clusaz, 8 bedrooms, walking distance from the ski lift and for sale at 1 490 000 €uros. Click on the picture for further details. 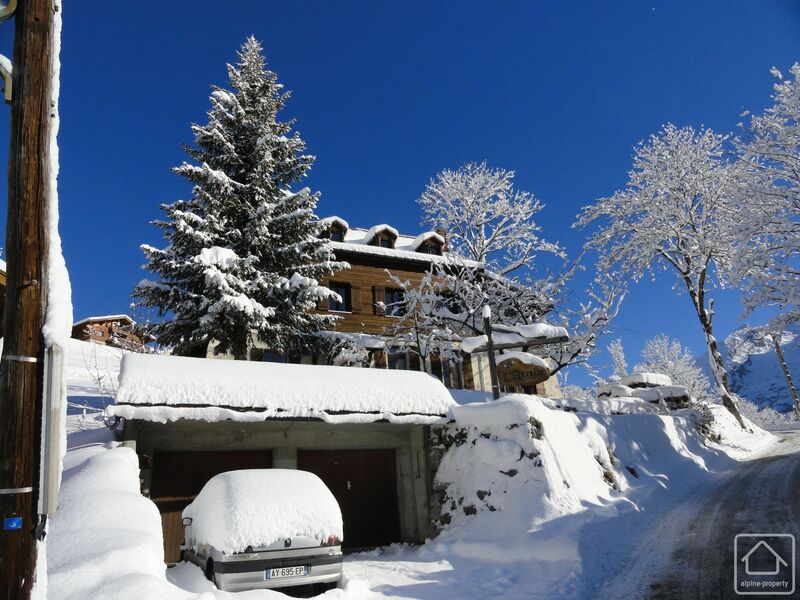 This entry was posted in Advice, Chalet Locations, La Clusaz, Les Gets, Morzine and tagged alpine chalet, catered chalet business, chalet business, chalet business for sale on 2014/01/31 by Gareth Jefferies.